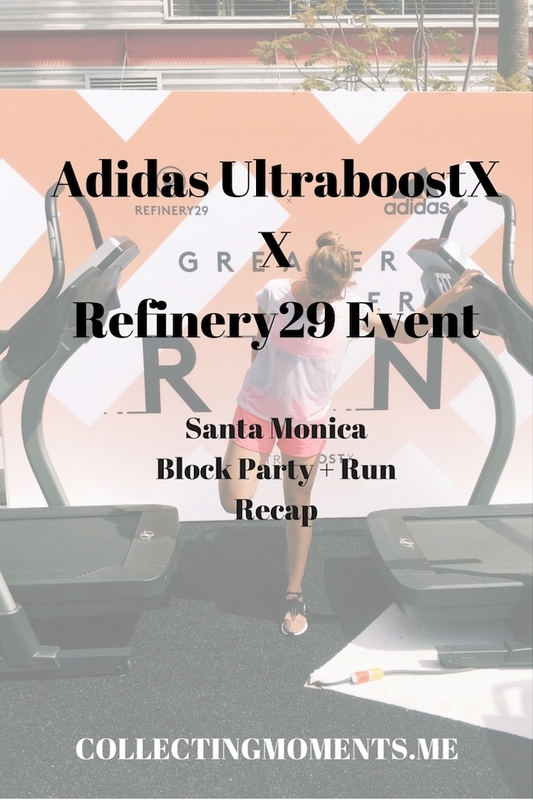 This past weekend I attended the Adidas X Refinery29 - Greater Every Run event in Santa Monica and it was so much fun! It was a day of fitness & fun and truly unique. The block party kicked off at 11:00 am with tunes by the beautiful Lola Langusta and the chance to try out the UltraBoostX shoes. I have to say, I have been following the Adidas Ambassador ladies along the launch of the UltraBoostX and I was really looking forward to trying them on myself, testing them out for a bit and getting a feel of what they had all been raving about! My verdict --> I need them! lol, but really the shoe is designed for women and meant to adapt to your foot and support your arch, aiding you in an effortless run - hence making you greater every run. Even though I didn’t get to go for a long run in them, I can definitely confirm how well they adapted to my foot and my arch (it was a weird feeling at first, as they feel very very tight - think compression socks- but after a couple of minutes, I got used to the tightness and could see how this actually made the shoe feel very light, which is exactly what you need if you’re going out on runs!) Anyways, back to my verdict - I need them! Lol and you can read a more in-depth description and customer reviews on the shoe here. Back to the block party-- after testing out the shoe, we were provided with personal lockers to stow away our belongings and were pleasantly surprised with a little goodie bag filled with yummy treats, an adidas water bottle and shoelaces! Thanks Adidas and Refinery29! Loved it! The fun continued with a performance by the Treadmill Dance Crew followed by the three blocks of different runs for the day. I joined the 1 mile run led by Remi Ishizuka and Meagan Kong and it was a fun, quick lap around Santa Monica. The other two runs were the 3-miler led by Diana Mireles and Mellie Cay and a 2-miler led again by Remi and Meagan. The event ran from 11am-3:00pm and was such a rad way to bring together the women/ fitness community in L.A., try out the UltraboostX shoe and enjoy a beautiful and fun day outside! Can’t wait to attend more of these events and share (or even better meet) with all of you! P.S - I had a pretty eventful weekend as right after the Adidas Event on Saturday, I also attended the LOOK GOOD + FEEL GOOD + DO GOOD event at LOVE Yoga- Venice, led by the beautiful Kelsey Lindell & on Sunday I had the opportunity to check out the new gym in DTLA Arts District, Sanctuary Fitness, and workout along Eve Yen and Hanna through a sweaty 50 HIIT session → will post details and more about the workout and gym very soon! Hope you enjoyed my recap! Have any of you tried out the UltraBoostX or have had the pleasure of connecting with other women thanks to your lifestyle? I would love to hear all about it!